Below, is a link to a very informative article giving a fairly accurate picture of the Global Satanic Conspiracy (updated 27 June 2015). The world is going through huge changes. It's now (11 December 2015) completely governed by a benevolent World Divine Government with a substructure of localised governing bodies in many pragmatically manageable regions throughout the world. The Satanists have lost most of their power. At the moment they are still controlling the media, desperately trying to pretend that everything is going on just the same. A lot of the news is fabricated and also uses old footage. The evil structures of the world are but a house of cards. The world is forever more in Safe Divine Hands for the benefit of all. God Bless you. Here's the link. The World Divine Government is looking after and protecting the world, the environment and all its beings and will continue to do so forever more. The world and its solar system will not come to an end, they are everlasting. A vast Satanic conspiracy to take over and rule the world has been foiled. All human beings are now being looked after very meticulously, they are all provided with shelter, warmth, food, clean water, medical care and so on. There are no more children starving to death from hunger, neglect, apathy and evil. And thank you Divine Mother so much for that. There is no more threat of nuclear extinction (the properties of all radioactive materials have been magically changed by Divine Mother to render them harmless and incapable of exploding). All other weapons are no longer functioning. The environment is being cleaned up. GM crops have been rendered safe. Many, many things are going on! The leader of the Divine World Government is a perfectly evolved Mother Goddess, all powerful, omniscient, and omnipresent called Alice, a Divine Queen. A Divine Queen is the servant of her people. There is nothing to fear from the world any more. Divine Mother Bless you Queen Alice. Over 700 million Divine Beings have also now come to earth to help out with this transition. Thank you very much to all those helping and guiding the world into a new and everlasting Golden Age. 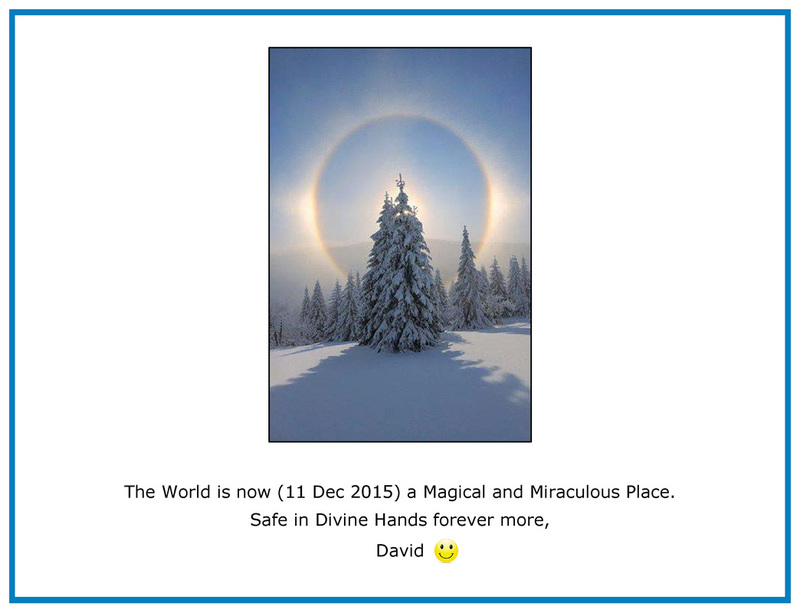 The World is Completely Safe in Divine Hands forever more.